Retired TV and Movie Star seeks job material handling job working for you! 2005 ATX 3000 with 188 MFH 3 stage Mast and 42" forks. 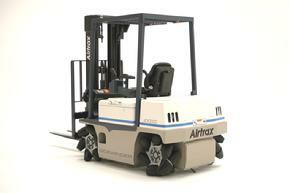 A limited number of SIDEWINDERs are available from Vetex refurbished to like new condition. Availible to ship to the US or Canada in 4 to 8 weeks. Price is $49,800. Includes new battery, rollers, and more. 188 MFH 3 stage mast and 42 inch forks. Other options available at extra cost.